The new MW9076 mini-OTDR series can perform a measurement three to five times faster than the well received, conventional MW9070B. Three and four-wavelength OTDRs are included among the new product lineup. 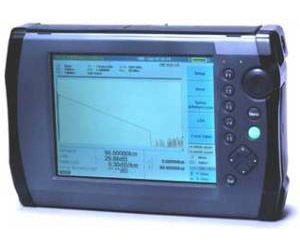 The four-wavelength OTDR can measure the chromatic dispersion characteristics from one end of an optical fiber. Two types of color displays with high resolution (5cm) and many sampling points (50000 points) are available for indoor and outdoor use. The MW9076 series shows superior basic performance that enables a wide dynamic range and a short dead zone. It supports the construction and maintenance of the optical fiber cables. Moreover, using this OTDR, it is possible not only to quickly charge a lithium-ion battery but also to indicate the remaining battery charge.